Social media is typically thought of as where all the cool kids hang out. Fast food, clothing, and entertainment all have it easy when it comes to making friends and getting retweets, but businesses in seemingly boring industries frequently settle for mediocrity out of the belief they can’t keep up with the “cooler” industries. But, Uri Bar-Joseph showed us five companies that shrug off the assumption that “boring” businesses can’t be exciting online. Every week we try to keep you updated with all the SEM news from around the web, but the Google I/O event this week was packed full of so much information there was bound to be some stuff we didn’t get to cover. Today, we’re going to cover all the latest news from I/O and everywhere else. We’ll start with Google, but there is also some interesting Facebook news to discuss near further down. To open the annual I/O developers conference, Google rattled off an impressive list of statistics, as large tech companies tend to do. Of these statistics, there is one that was noteworthy and shows just how prominent smartphones have become throughout the world. At last year’s conference, Sundar Pichai told the audience that Android had around 530 million active users per month. Over the past year, that number has almost doubled, surpassing one billion active users every month. Android users send 20 billion texts per day. They take 93 million selfies per day. Android users take 1.5 trillion steps each day. They check their phones 100 billion times per day. Android tablets represent over 60 percent of all tablets shipped. If you’re wondering what everyone is doing on their phones, you can be assured that it involves apps. 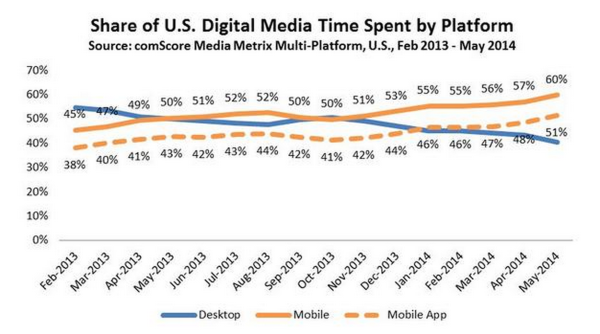 comScore released a report this week showing that over half of all digital media time is now spent using apps, though its unclear whether more time is spent on Angry Birds or The Wall Street Journal’s news app. Danny Goodwin from Search Engine Watch shared an example showing what the results looked like before (shown above) and what they will look like in the very near future (below). Google has expanded into seemingly every facet of online activity, but up until now they have left domain registration to other service providers. That won’t stay the case for much longer as Google recently announced they will be inviting a limited number of people to test their new service called … wait for it… Google Domains. As the shockingly creative name suggests, Google Domains will let users search, find, purchase, and transfer the domain or domains best representing their business. The service is still being built, which is part of why you shouldn’t expect for it to come out of testing in the close future. But, the service could potentially make the act of creating a website and establishing a company presence online much more easily understandable for the 55% of businesses that still don’t have websites. Edit the business listing by changing hours, description, etc. Facebook is constantly working on its News Feed algorithm and the latest update is intended to improve the quality of videos being served to users. The new video ranking takes note of how long users watch a video for and uses this information to influence content ranking. This metric will be combined with other long-standing metrics such as likes, comments, and shares. In the announcement, Facebook said, “In our early tests, this improvement resulted in more people watching more videos that are relevant to them.” The announcement also noted that twice as many people watch videos on Facebook compared to the numbers from six months ago. 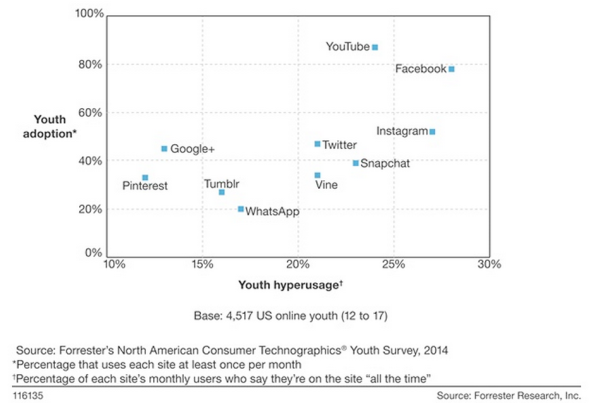 Wait, So Facebook is Still Popular With Teens? The problem with all this is, the numbers don’t entirely support that conclusion and two reports from the past week confirm that Facebook is still the most popular social site for the demographic by far. First, Forrester Research released a report showing that more than 75% of US online youth use Facebook at least once a month. Their survey polled 4,517 internet users between the ages of 12 and 17, and that Facebook has twice as many users as Pinterest, Tumblr, Snapchat, and more than Instagram and WhatsApp combined. You can find countless articles offering SEO tips filled with practical advice about how to stay within Google’s guidelines and optimize the code on your website. You’re also likely to find plenty of buzzwords and catchphrases like “content is king.” But, all of these practical tips won’t do you much good if you are approaching SEO with the wrong perspective. ResultFirst shared an infographic that can help you reshape the way you think about SEO and use a perspective that favors your audience, because a happy audience always leads to growth and success for your business. At this point, it is undeniable that any business with a website should have some form of mobile optimization, whether that means a responsive website, separate mobile URLs, or dynamic serving. But, many businesses with limited resources are attempting to solve this issue by essentially tacking on mobile optimization as an afterthought. According to a new report from BrightEdge, 27 percent of sites have some form of errors from improper mobile implementation. Even more so, the report claims that sites with mobile implementation errors can cost websites up to 68 percent of smartphone traffic, an increasingly important segment of traffic. BrightEdge’s Mobile Share Report examined the various types of mobile solution available and sought to uncover which configurations are the most likely to have some form of errors, as well as how these errors impact issues like rankings and traffic. Notably, Google has indicated that responsive design, dynamic serving, and separate mobile URLs are all accepted forms of mobile implementation, although they have also deemed responsive websites as their preferred solution. As such, BrightEdge was especially interested in seeing if sites with responsive design was less likely to result in errors or had a better chance of ranking. Interestingly, according to BrightEdge there was no significant difference between smartphone rankings based on mobile configuration. Notably, the report indicates any difference in rank is likely due to local search results pushing other more universal results down on the SERP. So, with sites using all mobile solutions ranking relatively even, why would Google endorse responsive design? Responsive design showed the least chance for mobile errors, especially over using separate mobile URLs. In fact, 72 percent of sites using separate mobile URLs had errors, while responsive design showed a minuscule number of sites with errors. Dynamic serving rested nicely in the middle with a 30-percent error rate. These errors are important because they create a poor user experience, which can push traffic away. Even worse, Google has outright said that sites who don’t provide a good mobile experience may not be able to compete in search results overall. While sites using the various mobile implementation options correctly are ranking fairly evenly, it is obvious that responsive design is still the safest bet. Any option can work, but you are significantly more likely to avoid errors that could cause you problems by simply choosing the least error-prone option: responsive design. For the longest time, online marketing was all about making yourself visible on search engines, with a heavy emphasis on Google. But, social media, smartphones, and the wide array of apps with their own search capabilities are beginning to take a chunk out of search engine traffic and marketers are going to have to expand their focus if they want to continue to be successful. A new report from Shareaholic shows that all of the top five search engines – Google, Bing, Yahoo, Ask.com, and AOL – have all seen a significant decline in search traffic since December of 2013. 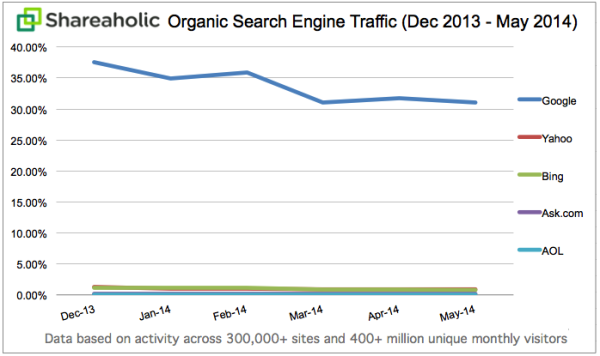 The report used data from December 2013 through May 2014 to evaluate aggregate organic search traffic numbers from more than 300,000 publishers reaching an audience of more than 400 million monthly unique visitors. From that data, Shareaholic saw that Google’s search traffic fell 17 percent between last December and May of this year. 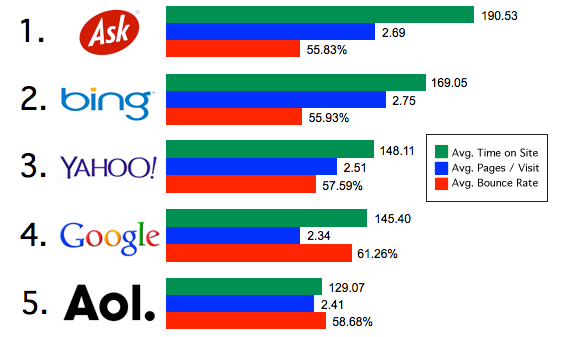 Bing, Yahoo, Ask.com, and AOL saw even larger drops in traffic compared to Google, with Bing and Yahoo both experiencing 31 percent declines. Shareaholic also looked at engagement from each search engine and found that although Google accounts for 17 times more traffic than Bing, Yahoo, Ask.com, and AOL combined, their users are often less engaged. This suggests that while Google may still control the vast majority of search traffic, it’s users may not be as valuable as the other more engaged searchers from across other search engines. All week we try to keep you up to date with the most important SEM news across the web, but inevitably there are smaller stories that fall through the cracks. That’s why we compile all the most important news we missed this week all in one convenient place every Friday. Despite the distractions of the world cup, there have been some pretty big announcements throughout the week. So, let’s get to it. With the clock ticking before Shopping Campaigns becomes the default campaign type for running Product Listing Ads at the end of August, Google is trying to help prepare retailers and marketers by issuing best practice guidelines to help everyone make the transition smoothly. However, marketers and retailers may be interested in the new recommendations about how to structure new shopping campaigns, especially as we enter the transition period. You can download the whitepaper of the guidelines from Google here. 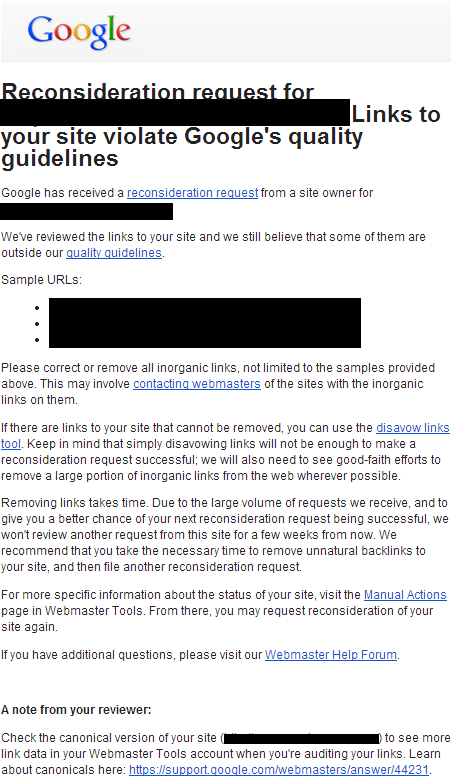 Last week, Matt Cutts made headlines throughout the SEO community by announcing that Google will be revising their reconsideration requests rejection notices with more detailed information in some cases. Of course, there were plenty of skeptics, but an example of the rejection notices has been shared on Twitter by @johnwarddoyle. Surprisingly, it seems Google made good on their promise. Don’t get too excited. The individualized response is short and easily missed, but rejection notices at least offer some useful information for repairing a site now. Largely the note is the same as before, but down at the bottom you will see a new section titled “A note from your reviewer.” Here, you will find specific advice relevant to your site that could be potentially highly useful. After having a $3 billion offer refused by Snapchat – the popular self-destructing photo messenger app – Facebook is trying to fight back. This week Facebook announced Slingshot, an app obviously influenced by Snapchat’s concept, but with a new twist. To get started on Slingshot, shoot a photo or video… add some text and color, then sling it to a bunch of friends. Here’s the deal: friends won’t be able to see your shot until they sling something back to you. They can then reply with a reaction – or simply swipe your shot away. The concept encourages reciprocal communication more and could potentially catch on, but it could just as easily fall apart in the shadow of it’s better-established rival. 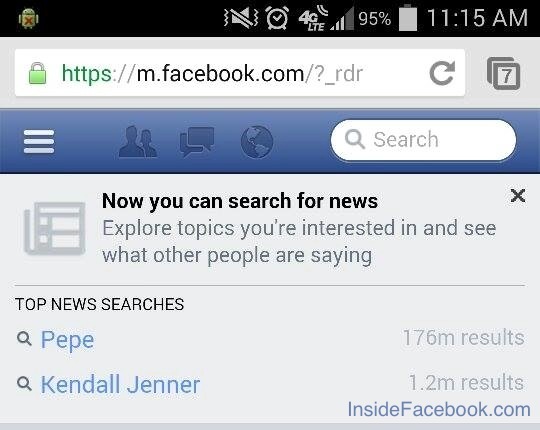 With the faltering youth activity on Facebook, it is hard to know how much traction this type of app can get. Speaking of Facebook’s problem of bleeding activity and user engagement, recent reports show that it isn’t just the teen demographic evaporating from the site. Facebook analytics provider Simply Measured says consumer engagement with Facebook posts from almost all top Interbrand companies are down significantly from last year. According to the firm, monthly engagement is down over 40 percent since May 2013. 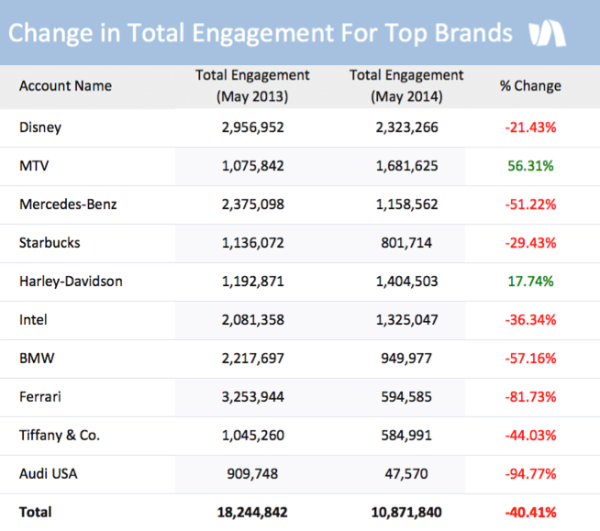 Only two brands on the list (MTV and Harley Davidson) say increases in engagement, while the others saw huge decreases. Overall engagement was down at least 50 percent. Most troublesome for Facebook, the report outright cites the decreasing organic reach available on Facebook as a primary blame for the decline in engagement. 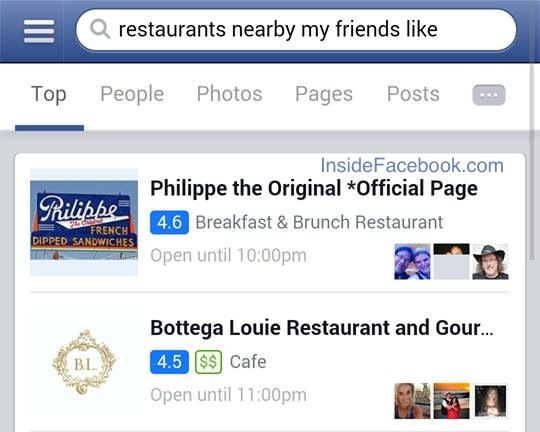 While Facebook’s Graph Search hasn’t been officially released on mobile yet, but it is most likely getting very close to being rolled out. Over the past week, many people reported encountering a test showcasing in-depth integration for the Graph Search for mobile users with all the same features you’ve come to recognize. The most anyone has gotten out of Facebook is the response “we’re testing improvements to Facebook mobile search.” But, I would wager the release will be sooner than later. The current testing version for mobile seems to be able to handle all the complex searches capable on desktop and appears to be largely ready for release. Twitter’s announcement this week may seem super minor, but it has received nearly as much coverage this week as any other bit of information relevant to online marketing. The reason is simple: internet users love GIFs and this week Twitter announced you can now post and view animated GIFs on Twitter’s website and mobile apps. Of course, the announcement came in the form of a Tweet featuring an animated GIF from Twitter Support. Previously, users could share links to GIFs via third-party services like Imgur, but starting this week you can now share and view the moving images directly on Twitter. Importantly, GIF’s won’t start playing automatically in your feed like they do on Tumblr. Instead, when a GIF is shown, a white play button will be overlayed, allowing you to choose when a GIF starts playing. 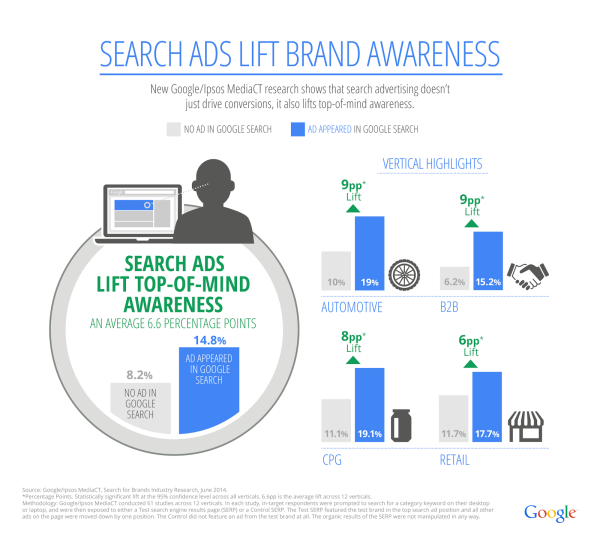 Google’s Latest Study Says “Search Ads Lift Brand Awareness”, But Is The Study Honest? Google announced the results of an interesting study this week that proclaims “Search Ads Lift Brand Awareness“. By the title of the announcement alone, it sounds like a promising reason to invest more in AdWords campaigns for your business, too bad the information is slightly misleading. Don’t get me wrong, pay-per-click search ads can be absolutely beneficial for a business. But, it is troubling when a group misrepresents their findings to a more positive spin when it clearly benefits their own business. Ginny Marvin was one of the first to point out the misleading nature of the Google report, and sums up the issue quite well by offering the alternate title “The Top Search Ad Lifts Brand Awareness”. The Google meta-study reviewed several studies conducted by Google and Ipsos MediaCT across a set of verticles including CPG and automotive. A total of 800 consumers were asked to search for a category specific keyword. Across those searches, the results showed that the test brands saw increases in awareness across all verticles. When respondents were asked what brand first came to mind when thinking about a specific category keyword, an average of 14.8% in the Test group named the test brand, while just 8.2% of the Control group named the same brand. That’s a 6.6 percentage point increase or an average 80% lift in top-of-mind awareness. That is all well and good, but the problem is Google only tested the brand impact for brand’s appearing in the top spot. None of the other ad positions were evaluated at all. The Test SERP featured the test brand in the top search ad position, with all other ads on the page moved down by one position. The Control did not feature an ad from the test brand at all. 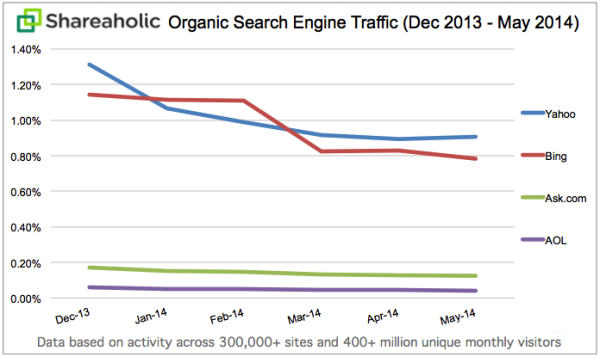 The organic results of the SERP were not manipulated in any way. Marvin is much more precise with her deconstruction of the flaw in Google’s study, but simply put: all ad spots are not made equal. In fact, like ranking positions, ad spots are highly inequal. The ads in the second and third positions are likely to experience in awareness, but the nature of the study makes that impossible to verify. Almost certainly, any awareness lift they see is modest compared to that found in the first position. In the end, Google’s recommendations based on their findings are probably still solid and no online marketer will argue about the value of branded paid advertising. Still, Google should be more careful with their words next time. Intentional or not, misrepresenting findings never looks good. Taylor Ball https://www.tulsamarketingonline.com/wp-content/uploads/2018/07/TMO-Logo.png Taylor Ball2014-06-18 13:35:512014-06-18 13:35:51Google's Latest Study Says "Search Ads Lift Brand Awareness", But Is The Study Honest? 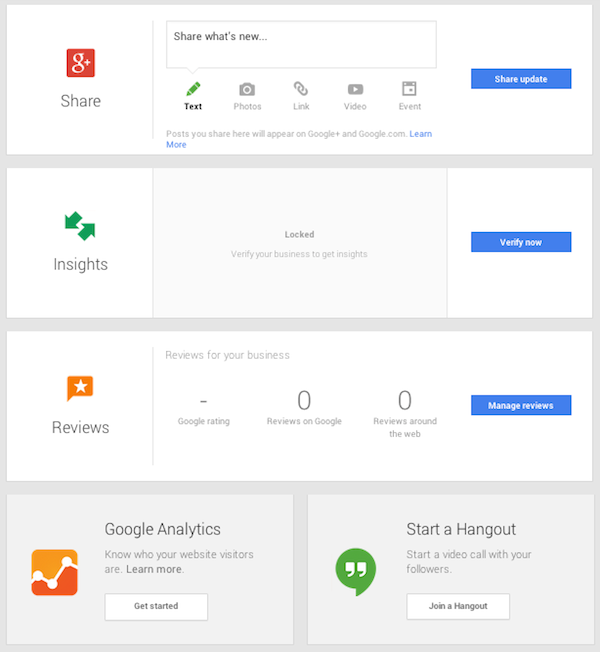 Google has been making some big changes to help businesses increase their visibility on Google Search, Google Maps, and Google+ by connecting business information across all of Google’s services. 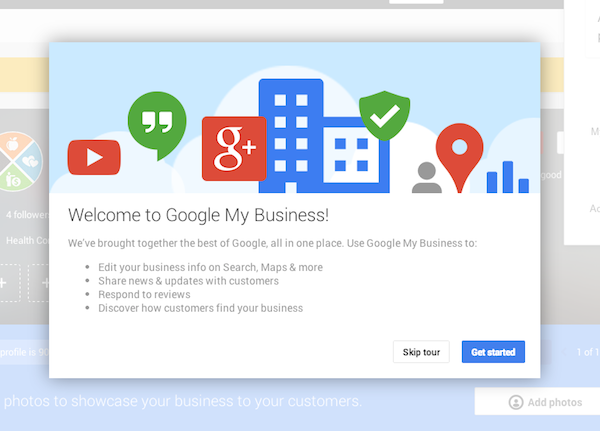 Google is calling the interconnected service Google My Business, which is set to be a one-stop shop which will allow users to access all their applications in one place. The service will help deal with duplicate entries across Google products by asking users to entire their information one initial time, then populating it into all of Google’s services at once. TechCrunch also reported that “owners can post news events, photos, and other updates they want shared with customers” in an apparent bid to rival Facebook. 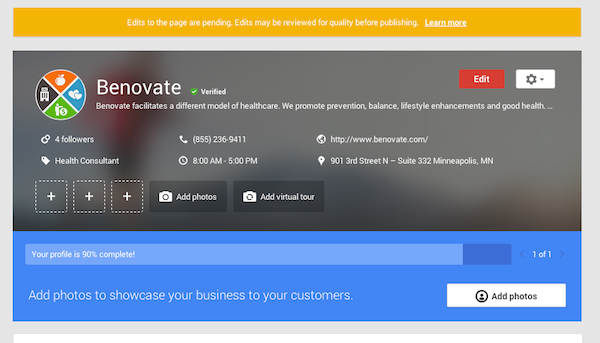 Once you’re signed in and Google has guided you through a tour of the platform, you’ll see a screen that houses your basic information that will appear on Google+, Google Places, and Google Search. From now on, you’ll be able to update business information such as store hours, phone number, or your website URL in one easy to access location. Beyond that page, you’ll be given access to the the really meaty parts of the update. From one screen, you’ll have control of your Google+ profile, from which you can share new text, photos, links, and events. You can also explore Insights, which will help you analyze your visibility, engagement, and audience. This screen also lets you manage your reviews, quickly access your Google Analytics dashboard, and even start a Hangout with the click of a button. 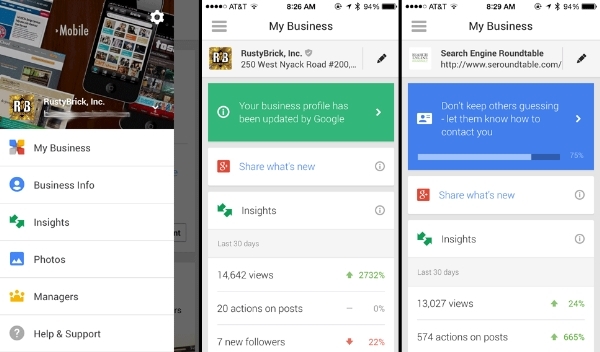 Notably, this update has already gotten a mobile launch on Android, and it appears the iOS version of Google My Business will be released n the near future. 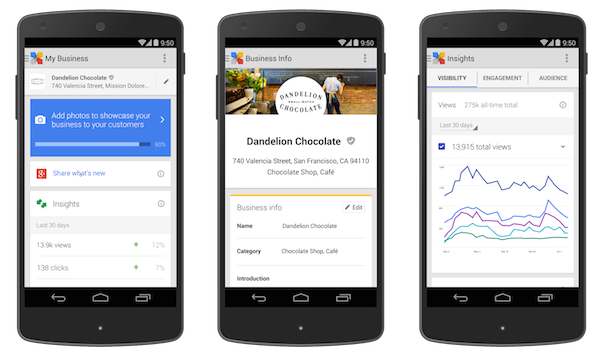 Google My Business makes it easier than ever for small businesses to take control of their own online presence and helps level the playing ground so that any company can benefit from being online. You don’t have to be a well-established brand to make yourself visible online. Social media is one of the best tools modern marketers and business owners have to connect with their demographic and build their brand. But, social media can also be a bit fickle or harsh. You can spend months or even years creating your brand’s online presence and building up an audience, only to create a massive PR problem with a single post. As the saying goes, the bigger they are the harder they fall. Whether it’s on Facebook, Twitter, Pinterest, or Google+, having a big audience only means you have more eyes scrutinizing your every Tweet and Pin for a potential scandal or brand breakdown. You don’t have to get too worried though. Nearly every big social media mistake can be avoided by following some simple rules. Search Engine Journal shared a list of 30 ways you can make a mistake on social media. While the list may seem long, it provides a complete guide to social media – from building an audience to avoiding any meltdowns or missteps in the future. 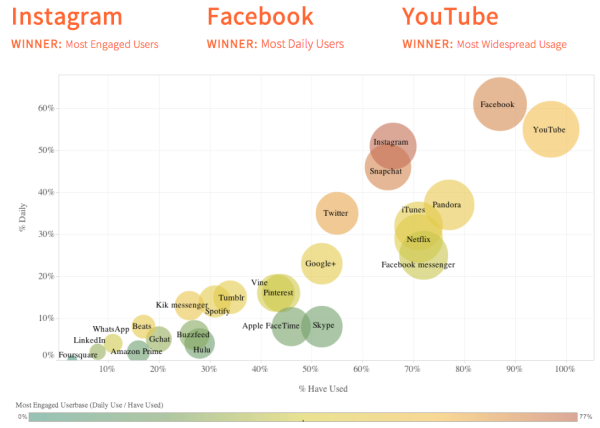 We are just a day away from the start of World Cup 2014, and this year’s competition will be the most socially connected yet. Social media use is at an all-time high, and Twitter and Facebook are locked in a battle for the place as the dominant platform users turn to for keeping up to date with scores, game times, and fan response. Though soccer is often treated like a novelty in the US, the sport actually has a strong and passionate audience across the country – not to mention the unbelievably large fan base around the world. FIFA claims that around 3.2 million people watched at least one game of the last World Cup in 2010, and this year seems likely to get even more viewers. As Twitter and Facebook made clear with announcements yesterday, both platforms are hoping to get a piece of the action by rolling out campaigns aimed at promoting soccer and encouraging fans to turn to their specific platforms. 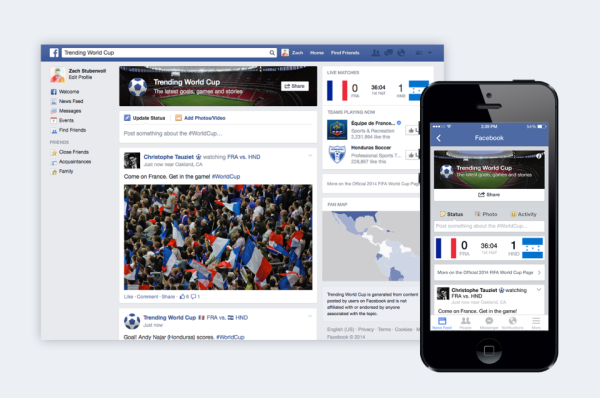 Facebook’s News Feed algorithm isn’t exactly well-suited for keeping up with real-time conversation like Twitter is, but it is offering a Trending World Cup page designed to help fans follow the latest scores, match highlights, and conversation. The page will even allow users to click through a global map which displays the Facebook popularity of top World Cup players. Several people, including Marketing Land, have already used the global map to discover some fairly interesting statistics, such as England’s Wayne Rooney being strangely popular in Namibia. As with all of Facebook’s trending pages, the World Cup page will also show the latest posts from friends, players, teams, and the media making sure you never miss a spectacular goal or scandalous foul. Facebook users will be able to filter conversations based on the specific match they are watching as well, once the games have started. Twitter users can already access a dedicated World Cup landing page via the hashtags #WorldCup and #WorldCup2014, which offers a scoreboard and updates with conversation about the event and games. Similar to Facebook, Twitter will also allow users to organize what content they are seeing by selecting “match timelines” that only show tweets about specific games. This is fairly standard for users, but Twitter users from the last World Cup may be excited to see that “hashflags” are returning for the latest competition. Introduced for the 2010 World Cup, the feature displays flag icons of people who include appropriate three-letter hashtags in their tweets. Before the games kick off on Thursday, Twitter will also unveil “The World Cup of Tweets” bracket. The social platform is also acting to retain new users who choose Twitter for their World Cup 2014 social needs by adding soccer suggestions to the sign-up process throughout the games.